Mr. Toyoda is not talking about Volkswagen, GM or Audi…he means Google & Waymo, Uber, Lyft and the rest. 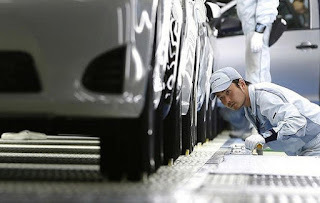 After developing & deploying of the legendary Toyota Production System (TPS) in facilities around the world, Toyota is finding it’s not enough. TPS is necessary to be sure, as Elon Musk and Tesla are finding to their chagrin, but not sufficient. We have to deepen and extend the Toyota business system with digital methods. A tough challenge for a proud, conservative company that historically has been slow to adopt digital technology. For example, in the 1990’s at our old TMMC plant in Cambridge Ontario, providing computers to managers and group leaders was a big deal, which generated much soul-searching. Grudgingly, our old senseis relented, though they continued to write their A3s in pencil. And when it came to strategy or problem solving, they taught us to never trust the computer screen, and always to go and see for ourselves. Were they wrong? But in an age of explosive technological change, Value – the raison d’etre of TPS – is a much more elusive target than it was in the 1990’s. And we have to change to keep up with it. It’s no longer enough to build a splendid car – you also have to stuff it with splendid computers, connect to an ecosystem of enablers, and perhaps make it drive (fly?) by itself. Which means you have to keep innovating forever. In short, continuous improvement is necessary, but not sufficient. Whenever we need to create something new in conditions of extreme uncertainty, we need a new set of arrows in our quiver: continuous innovation. Not everywhere, let me hasten to add. Continuous innovation everywhere, a common cliché & conceit these days, is a practical absurdity. For example, if you’re making kitchen towels in a factory in Utah, extruding plastic auto parts in Michigan, or piloting a container ship up through the Suez Canal to Rotterdam, your focus will be continuously improving. Every organization needs a foundation of standards and stability. The digital tsunami does not obsolesce these core needs – it depends on them. But if you’re a product/service leader in any of these industries, the entire customer experience is your chessboard, and the Eight Essential Technologies* must inform your moves and thinking. Wherever we need to create something new in conditions of extreme uncertainty, we need to learn to iterate to value, i.e. innovate continuously. Imagine team members and leaders at a world class muffler manufacturer who have spent a few decades refining their Single Minute Exchange of Die (SMED) processes! So it goes when you focus on methods, and not the thinking behind them. SMED is a countermeasure to a specific problem. If SMED all you know, then digital is a big problem. But if you understand the thinking behind SMED, and TPS as a whole, with hard work & reflection you should be able to apply it to new problems. Humility is also a great enabler. It’s healthy to accept that what we did in the past is irrelevant to most people. What have you done for us lately, is a severe, but in my view, fair test. Indeed, it’s the very question facing Akio Toyoda and his splendid organization.